Below are four very different examples of my work. I have featured Duke who had a fear of the farrier image and had become completely traumatised at the sight of a rasp, chaps and the sound of metal banging, and had therefore developed a severe foot handling problem. 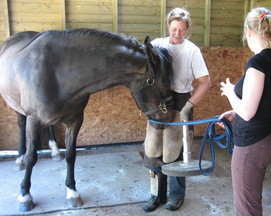 Duke was only previously able to have his feet trimmed under heavy sedation. After this I have chosen to feature Harley, ( video footage included) who at the time was an18 month old Appaloosa. Harley had a pretty rough start in life, but was rescued and now continues to go from strength to strength. I have included video footage of me working with Harley during a pole training session, a walking over tarpaulin session and finally his first loading training session. Next is Seren, an 11 year old Welsh Section D (video footage included) showing an excellent example of focussing on the handler, impeccable manners, attentive and respectful in manner, and a prime example of safe leading both on and off the lead rope. Lastly is Maise, a 9 year old Welsh Section A (video footage included) who came to me to be backed and made safe for a child to ride. Maise spent a total of 14 days with me and we did mainly half hour sessions each day with just 2 days off. Here I am training her to stand still if the rider falls off. I worked on getting Maisie used to rider mounting from both sides and falling off in every number of combinations on both sides that I could think of, including over the head and off the back! Recently one of her little riders did have a fall whilst cantering and Maisie apparently just stood still unphased. 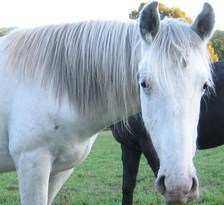 Irish Cob Bay Gelding aged 11 years old. I first met Duke cowering at the back of a herd of 5 horses. His owner had been unable to cope with him and so had put him out on loan after he had displayed some aggressive outbursts towards her in the field and had begun rearing whilst out hacking. Within 3 months Duke was back home. His owner had gone to see how he was getting on at his new loan home and had been horrified to witness that Duke was being made to go over a succession of jumps; rearing virtually to 90 degrees upon landing, then being whipped and made to continue. The rider was also using spurs aggressively. His owner demanded that he be returned to her. Duke who had previously been a good loader, had to be blindfolded to load and arrived home drenched in sweat. My first meeting with him was the following day. I was told that he would be difficult to catch and even when using the most submissive and non agressive body language, along with as low an energy as I possibly could, it became apparent that there was no way that Duke was going to trust me enough to let me put a head collar on him. So, after several attempts, when he went to move away, I gently sent him away from me by looking him directly in the eye, which horses interpret as aggressive and placing my shoulders square to his, again interpreted by horses as an aggressive gesture. My aim behind this decision was to show Duke that being with me was his best option and a safe place to be. When Duke showed signs of not wanting to be with me by running off, then I basically used my body language in such a way as to continue to send him away, effectively saying `That's fine if you would rather not be with me, you are free to choose your own course, but if being away from me is what you would prefer then "shoo", and go away down the path you have chosen. I will continue to send you away down your chosen path'. I had my work cut out though as the field was large! Soon the other horses knew that it was not them I was interested in and they settled down and stayed out of my way. Now I was able to communicate effectively with just Duke. He ran in large circles around me as I continued to send him away by looking in his eye and squaring my shoulders to his. After using my body language to make him change his flight direction several times, I then began to see him offering me some clear signs of communication. Firstly his ear nearest to me, locked onto me, a sign which basically means that the horse is showing you respect. This was followed by Duke trying to make the circle smaller and trying to come closer to me. I continued to keep him travelling on the outside of the circle as I needed to finish `the conversation' with him so to speak. There were still two more signs that I was looking for him to offer me in order for an environment of co-operation to be set up between us. In response to me keeping him on the outside of the circle he then began to lower his head, `bobbing' it along the ground, which can be interpreted as `should you like to discuss this, I will let you be the chairman of the meeting' and then finally I saw Duke `licking and chewing' which is a sign of submission, or relaxation, and which is similar to the gesture a foal often uses, whereby it will snap its mouth open and shut to the elder members of the herd. At this point I then was able to 'invite Duke in' to me. I made the `invitation in' as strongly as I possibly could in his language, so as to reinforce his choice. This I did by lowering my eyes away from his and turning my shoulder submissively at a 45 degree angle. With my energy low I waited as Duke gently walked over towards me and reached his nose out to touch my shoulder. I very quietly and carefully turned, keeping my eyes away from his and reached my hand up very gently to stroke his forehead, (allowing this showed that he trusted me, as this is an area that horses can't see). This was the moment of `join up' . From here I proceeded to walk calmly but assertively forwards, with Duke following me at my shoulder. I turned left, and he turned left; I then turned right, and he turned right; wherever I chose to walk Duke was there at my shoulder. This is known as `follow up'. He seemed such a gentle, willing horse and wore a submissive look on his beautiful face, carried his head low and when I stopped walking and just stroked him, he let out a big sigh. 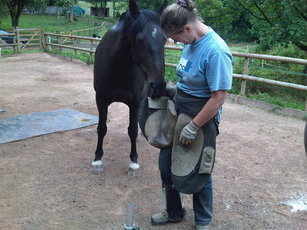 From here I gently put on the headcollar, as this was what I had initially set out to do. Although it was not really needed now, I needed to know that he would co-operate with my requests. I then asked him to move his hind quarters over. This he did easily from the near side, but he had difficulty on the off side. Duke was also very sensitive and tentative to touch on his off side. He also appeared, although willing, to have difficulty moving backwards. He didn't look comfortable and was carrying his tail slightly to one side, which suggested perhaps a misalignment of some sort. I decided that before any training sessions took place I wanted to get his back alignment checked out and also wanted to see what was happening muscle wise as he was incredibly tight in places. I needed to know that he was sound physically before asking anything of him. The assessments that were made confirmed that he had several misalignments. He flinched at a hand touching his wither area, which was probably due to a badly fitting saddle and he was also incredibly tight around his poll and atlas area and in his neck muscles; also several large muscle groups in his quarters were not working correctly. So Duke embarked on a series of McTimoney and physiotherapy sessions in order to help him feel more comfortable, and began to receive daily massage to try and loosen him up. Quite often after his McTimoney sessions he would go out calmly into the field, let out a big sigh and just lie down to sleep, which was amazing to see as he generally was very highly strung and tended to do everything very quickly. Talking to his owner, she told me how he had apparently arrived in this country from Ireland with a set of shoes on and had to be sedated to have them removed! 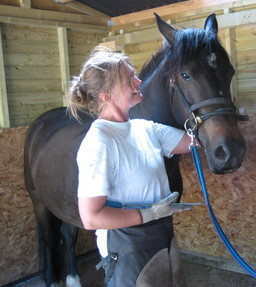 In all the time that Duke had been with her, he had shown a huge fear of the farrier and could only be trimmed with sedation. This for me was the obvious place to start. 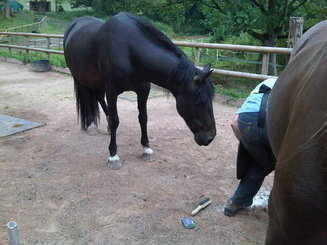 I had to rebuild the trust in Duke enough for him to have his feet trimmed regularly without sedation. If his feet were not in balance then this was obviously going to have a knock on effect on his alignment and muscles within his whole body. I worked with Duke each day until he would give me all of his feet nicely and l could pick them out successfully, but even though he was willing he always seemed really uncomfortable about giving me his right front foot. I suggested that Lindsay Cotterell trim his feet, as not only had she looked after my horses' feet excellently but she had also done all the Intelligent Horsemanship courses and had a good knowledge of the horses language which was crucial at this stage for Duke. Duke was always quite cautious of people generally, but upon meeting Lindsay for the first time, although wary, he allowed her to approach him and even lift his feet, however, when she then put on her trimming apron/chaps and produced the trimming equipment, he fled, snorting, breathing rapidly and looking absolutely terrified. The equipment and chaps were removed from his sight and I set about catching him and putting on a dually head collar. 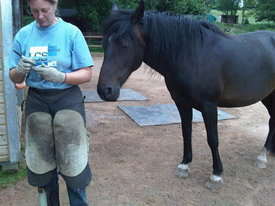 I proceeded to do some gentle ground work exercises to calm him, and eventually Lindsay was able to approach him again. From here Lindsay took over and continued to move him gently around. Eventually he was able to give her all his feet, though showed some reluctance with his right fore. Lindsay was however able to have a good look underneath. Duke's front feet were pigeon-toed and underneath she observed a significant medial twist in his right hoof capsule with increased lateral wear and compensatory imbalance. She also felt that he was in physical discomfort when this limb was elevated as this provoked a huge adrenaline rush and panic. 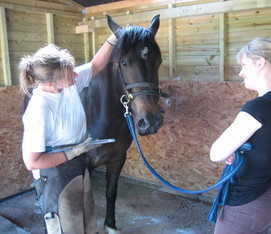 It was very evident to her from his hoof wear that he was experiencing physical discomfort above, but for Lindsay to be able to trim Duke and handle him safely, a combined approach of physiotherapy, McTimoney Chiropractic work along with lots of ground work to ensure safe handling would be necessary, along with a training plan aimed at desensitising Duke to the rasp, chaps and noise of metal banging. This would ensure the removal of any physical pain and restore psychological balance and well being in Duke, enabling him a successful way forwards. It was during one of his McTimoney chiropractic sessions that there was a sudden loud `pop' sound which occurred as work was being done on his right foreleg, followed by a big sigh from Duke. Following this he found it much easier and became much more willing to lift this foot. My work with Duke involved much `advance and retreat' work with the rasp, to which he initially showed absolute terror; sweating, snorting and not allowing it anywhere near him, and displaying moments of sheer panic. I worked with him on a dually head collar and a 30 foot line initially holding the rasp out in front and asking him to follow it (as anything that moves away from the horse he won't interpret as predatorial). This was mixed with gently trying to move the rasp towards Duke until I could touch him lightly on his shoulder with it. Each time Duke went to move away, I stayed with him and when he stopped moving I took it away. He soon began to learn that what he perceived as dangerous (the rasp) went away when he stood still. 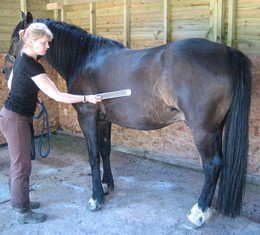 From here, using this advance and retreat method, I was gradually able to touch his neck and shoulder, eventually working my way down his legs, each time keeping the rasp on him when he was moving and then taking it away when he stood still. Gradually I increased the length of time I kept it on him and gradually Duke realised there was no pain and nothing to fear. Occasional flashbacks would occur but we worked through these calmly and I always kept the sessions short. By the fifth session I was able to run the rasp over the front of his hoofs. He was not completely comfortable with this but accepted it, and showed no signs of sweating. He allowed me to touch him with it all over his back, sides, legs and belly and he produced only one snort at the end of the session as we were following the rasp away. During session six he showed no signs of sweating or snorting and seemed comfortable being touched all over and down his legs, allowing me to pick up both front feet and lightly rasp! This was a real major breakthrough. Finally during session seven he gave me both front feet straight away. I picked them out and then rasped very lightly over the front, not taking off material but just getting him used to the sound, feel and action that Lindsay would be doing. Duke stood beautifully and showed none of the signs of anxiety that he had showed at the beginning of the week. I was also applying a more firmer and assertive rasping action. From here I continued to use a cotton apron to act as chaps and then progressed to tying my waterproof jacket around my front like an apron, this had the advantage of being a bit noisy as well, which was good for him to get used to. He was cautious to begin with but his reaction was far less than it had been to the rasp. During this session I also used another horse who was excellent with his feet. I would go to the other horse, lift his foot and do a rasping action, then approach Duke and lift his foot and do the rasping action and then go back to the other horse etc. this not only gave him short breaks and released any pressure on him, but also helped him see the other horse calmly accepting the rasp. 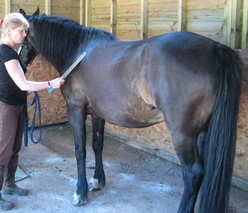 Lindsay's visits would include her trimming two horses who were excellent with their feet whilst Duke watched freely of his own accord so he could walk away if he wanted to, but generally he showed quite a bit of intrigue. Lindsay would then approach Duke without her chaps and ask for his feet and then gradually supported my work by lightly rasping without the chaps and then gradually introduced the chaps etc. Duke has continued to go from strength to strength. He still sometimes has a funny few seconds, probably a flashback of some sort from his past, but he is soon reassured and generally is fine now. He now allows Lindsay to trim all of his feet, and even almost fell asleep during one of the trims! He has still yet to fully accept the foot stand for his hinds but allows Lindsay to rasp them so we are getting there. During his training with me he made quite a few friends and has ended up staying with me permanently. Duke is a great companion for my horses and enjoys being walked out in hand, massaged and loved. 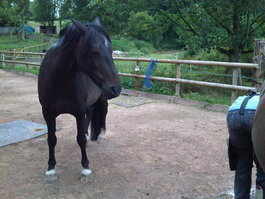 I did re-back him recently but until I have a proper saddle fitted then I do not intend to ride him. For the time being he is enjoying life relaxing and taking it easy. His previous owner enjoys seeing him regularly. 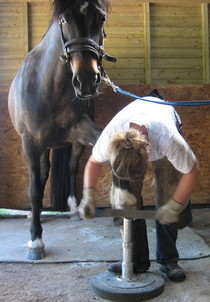 Lindsay commented after her first encounter with Duke that she had never witnessed any horse so terrified of the `farrier' image. The method used to train Duke to overcome his fear was not difficult or complicated but based on the language of the horse and the horses psychology. So many problems can easily be fixed using this knowledge but just as importantly so many problems can easily avoided by using this knowledge. Duke's off side was his most sensitive side which he strongly protected. Duke having overcome his fear of the rasp, allows me to gently place it in the vulnerable areas of his body, and shows no reaction, but remains relaxed and trusting. I strongly believe that learning the language of the horse is surely the best gift you could ever give to your horse. Duke's previous owner and I are hugely indebted to Lindsay for her tremendous patience and kind ways; helping Duke to rebuild this trust and find comfort again. Also I would like to thank McTimoney Chiropracter Ruth Greenhill and Equine Physiotherapist Sarah Price for all their hard work and gentle ways with Duke, helping him on the road to recovery. An 18 month old Appaloosa. Harley's owner Helen, bought Harley unintentionally! Helen went to view a coloured horse for sale, who was advertised as a nice quiet hack, and whilst there heard a noise coming from a disused railway carriage, near to where she was viewing the coloured horse. After enquiring what the noise was and being told it would be nothing of interest to her, curiosity got the better of her and she virtually insisted on knowing what was in there. When the door was opened, to her horror she found that the carriage had been split into 2 and a little white nose peered out at her followed by some tiny little eyes that obviously hadn't seen daylight for a while. It was a 6 month old Appaloosa foal, that had recently been weaned. "I'll take this one" she said. Helen had immediately fallen in love with this poor little foal and couldn't wait to take him away. Unfortunately that wasn't to be the case for quite a few days as she had to arrange a time that they could bring him over to her and she had to make arrangements at her end. Harley was delivered a few days later in a sheep trailer, chained to a sheep gate at the back of the trailer and was not in the best of condition. He was very ribby and covered in lice. 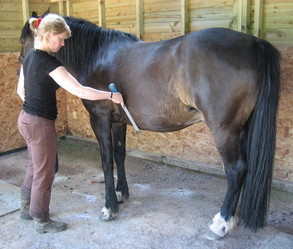 His coat was extremely matted in places especially all over his belly which was covered in his own dung. I was called in after Helen had not suprisingly discovered that he was difficult to catch! With much committment, and determination Helen followed my training plan and eventually Harley became easy to catch. His lice were treated and cleared up and he soon began to put on some weight and gain confidence. Below is a video clip of Harley at 18 months old during a training session with me. He is leading beautifully and learning to back up through L shaped poles. Having control of every direction that your horse's feet can move in, means that you have control of your horse. 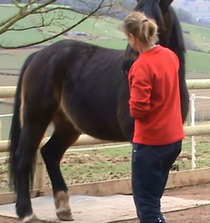 I have found that teaching a horse to `back up' is one of the most useful training exercises that you can do. When as a handler we ask the horse to back up, we are showing the horse that we have control of his/her movement; the horse no longer owns that movement and so therefore is less likely to use it against us, ie. nappy behaviour or rearing. It should also be considered that the horse has to really trust you in the `backing up' process as they cannot see where they are going due to there being a blind spot directly behind them. 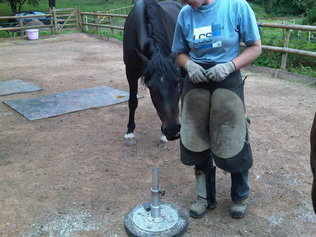 Also 'backing up' is a useful tool when it comes to loading a difficult horse which I explain in more detail later on. The exercise also has the added bonus of teaching you to be able to manoeuvre the horse accurately whilst in reverse, teaching you about how what you do with your body affects what they do with theirs! Following on from the backing up exercise, I trained Harley to walk over tarpaulin in preparation for loading. I wanted him to trust me enough to walk across it and experience putting his feet onto something unfamiliar that makes a strange sound, in preparation for the ramp! Here is a clip of Harley at the start of the session, initially refusing to walk over the tarpaulin!!! Ok, so he jumps it! but never-the-less a step in the right direction. I gradually opened out the tarpaulin bit by bit and continued working with Harley until he was placing all 4 of his feet on it and walking across calmly. Eventually Harley walked over the full size of the tarpaulin which is shown on the video clip below. The next step was to introduce Harley to loading. This was done on a separate day. Here is a very short clip of Harley being shown the van for the first time. He is wearing a heart rate monitor so I could see what he was experiencing on the inside. He clearly did not want to load and was very tentative and nervous of what was being asked of him. And finally here is a clip of Harley showing a huge amount of trust as he loads beautifully onto the van, manages the turn very gracefully and then calmly walks off. I took Harley off and on the van a further 4 times to let him see all was ok and to allow for his heart rate and adrenaline rate to fall. A low adrenaline rate means an increase in learning. The total length of the session was just under 9 minutes and that was including the extra 4 loading off and on practices. The success of this was down to all the preparation that had happened in the weeks and months beforehand. Harley had learnt how to lead beautifully, respect the handler's personal space and had built up trust and confidence through the tarpaulin and pole exercises. Well, why might this be the case? `Backing up' is physically a very difficult movement for the horse to perform, being anatomically designed to go forwards. In the wild, horses will rarely back up for long periods of time, perhaps only a few steps until they are able to turn and spin in order to flee from danger. 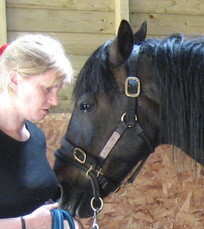 Like I explained above there is the issue of trust, learning how to reverse a horse accurately and also when we as a handler ask the horse to back up, we are showing the horse that we have control of his/her movement; the horse no longer owns that movement and so therefore is less likely to use it against us, ie. rearing and napping. Interestingly from a heart rate point of view, backing up raises the heart rate, which was the case with Harley. There is also the concept that you are playing a little with reverse psychology! saying in effect ` Do you know what ? Lets not go forwards. I don't think going up the ramp today is really necessary, why don't we go backwards away from the ramp instead', this way the focus of attention is not really on the going forwards - but the horse feels that it is harder work going backwards and soon decides that forwards is the best, easiest option. This approach can also help the handler to not think along the lines of `YOU WILL LOAD. LOAD FOR CRYING OUT LOUD! MY SHOW IS IN AN HOUR'S TIME'! Coming forwards on the other hand is a much easier movement for the horse to perform physically; the horse can see where he/she is going and as long as the handler has good body language and doesn't block the horse, then this becomes the easier option. This ties in with Monty Roberts theory that the horse will always choose the path of least resistance i.e. the easiest path. Interestingly but not suprisingly, coming forwards produces a lowering in the heart rate as was the case with Harley. Monty Roberts writes in his book `From My Hand to Yours' "the horse that willingly backs up and comes forwards is more likely to load willingly" and this is largely responsible for the ease of which Harley loaded above. Other interesting heart rate results, showed a considerable lowering of the heart rate when I gave Harley a `lovely rub' on the forehead. This is an area that they can't see and so therefore they really need to trust you to allow you into it. It would also feel really nice I imagine! Sighing produced a lowering of the heart rate. Licking and chewing produced a lowering of the heart rate, as Harley showed signs of relaxing. Standing still also produced a lowering of the heart rate, which I did with Harley in between practice loads and when he was being particularly responsive. A rise in Harley's heart rate was seen when he put just his front feet on the ramp and when he was walking up the ramp, which one would perhaps expect. Although I didn't see this with Harley, other interesting findings through other horses that I have loaded have shown that the heart rate reduces significantly when the horse refuses off to the side of the ramp, or just plants their feet at the foot of the ramp. 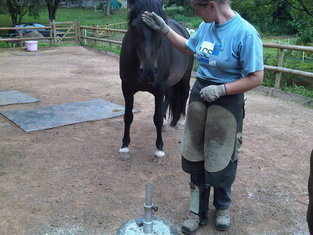 This I believe is due to the horse feeling that they have control of their feet, as he/she plants themselves. Although, it should be considered that the heart rate may not be low in the case of a horse that is refusing to load because he/she is genuinely fearful, perhaps due to a bad experience of either travelling or being made to load forceably. You may also be interested to know that the following 4 loads that Harley did saw heart rates of 105bpm and 83bpm, being comparible to that of a horse in a fast trot, and also 90bpm and 70bpm, comparable to that of a horse in either walk or a slow trot. Harley's 'activity between heart beats' result showed him to be quite high and yet he displayed no obvious behavioural signs to suggest that he was particularly stressed by the situation. An interesting result to think about. When Harley initially saw the van and refused to go forwards onto it, then through understanding about the psychology of the horse and having studied the horses language I was able to work with Harley in a gentle, but assertive manner, and communicate to him in such a way that his adrenaline levels were kept as low as possible and therefore his learning ability was kept to a maximum. Horses and ponies are flight animals. If adrenaline levels are raised then their instinct is to flee, not think. Their ability to learn is severely diminished and an unhappy relationship of struggle, frustration and in some cases fight and danger is developed. Unclear communication and pain are the main two culprits for raising adrenaline in the horse. 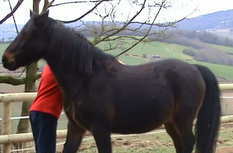 By learning the horse's language and psychology, so many problems can not only be solved but avoided. It is possible to get a horse to do pretty much anything, but my aim is always to get the horse`to want to', this is at the heart of developing a great bond and relationship with your equine partner. Harley is now on the right road (literally!) to success in all that he does. Helen continues to regularly introduce Harley to new things and experiences, making sure she is setting things up for his success. She is enjoying learning all about his language and psychology and their relationship has gone from strength to strength which is lovely to see. The next step is an introduction to roller and long lines! 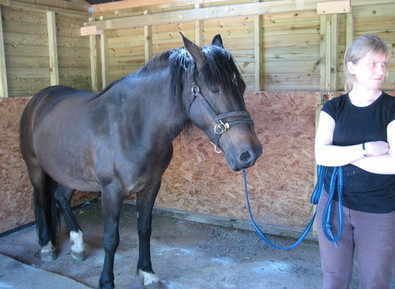 Seren is a beautiful, very sensitive Welsh Section D mare. This short video shows me working with Seren in my round pen. Seren is doing a fantastic job of demonstrating beautiful ground manners, and what one would ideally be aiming for with regards to safe leading of their horse or pony. I start by having a long lead rope clipped on so that I can sculpt her using 'pressure and release' where necessary, to where I want her to be which is ideally with her nose in line with my shoulder and a good arms length away from me which keeps me out of her flight path! When I remove the line you can see she is still very happy to follow me and for me to be her leader - this is simply because I have worked with moving her feet in every direction and never allowing her to move my feet; Seren therefore sees me as her leader and a safe place to be. A great place in the relationship to start any kind of work or training from. Maisie is a beautiful, 9 year old Welsh Section A who came to me to be backed and made safe for a child/children to ride. This video clip shows me training Maisie to stand still if the rider falls off - we covered every combination that I could think of! Oh yes, and here is just a little clip showing that it is possible for pony's to behave when working on grass - you just need absolute consistency. If they sometimes get grass from pulling their head down and sometimes they don't then the grass snatching can become really addictive as sometimes it works and sometimes it doesn't, a bit like gambling can become to a human. If you always lost when gambling it would quickly loose its appeal, and because you had no pay off for doing it then it would quickly become something you couldn't really see any point or fun in doing, but you only have to win once which strikes that thought of 'maybe this time I might? let's see'. It's the same mindset with ponies and grass. If they never succeed once wearing their headcollar or bridle then they quickly learn that there is no point in trying. Some times according to the nature of the pony it may be possible to set up a cue such as patting the ground to say it's OK to eat now, but not in all cases, and again you would need to be incredibly consistent with this for it to really work. Anyway here is the clip showing Maisie ground tied and being as good as gold! And lastly just a quick note about hand feeding. I always recommend that you NEVER hand feed your pony or horse. Feeding by hand as in from your hand encourages biting. Next time you give your horse or pony a feed in a feed bowl note how they treat the BOWL, quite often they continue to bite the bottom of it in search for more food that the bowl produced. I have a pony who throws his bowl after biting the bottom of it when empty. They have no respect for the bowl, and its the same for your hand, they may continue to bite the bottom of your hand or become very pushy towards you if they start to see you as the HUMAN BOWL. Pony's and horses walk all over grass and hay, its there for them generally in abundance and as Monty Roberts always says, 'no blade of grass has ever run from a horse' so grass isn't seen in their eyes as a reward or trophy like say for example hunting is to a predator . And just before I sign off just one more thing that may be useful for you to avoid and that is playing unnecessarily with the horse's muzzle and mouth. Constant touching and stroking of this area is probably annoying for them and it is just reinforcing that it is OK for the pony or horse to touch you with this area. Their mouth and muzzle are like our fingers, they explore things with them. After the touch usually comes the teeth, not necessarily in an aggressive way but in an exploring way. So, don't be suprised if after touching you gently with their mouth (which you may have encouraged them to do) the teeth appear, best to not encourage this behaviour in the first place by drawing a clear boundary line so there is no chance of confusion. Just some food for thought!